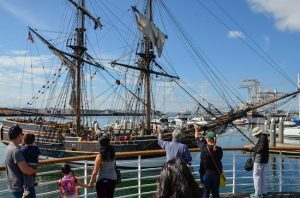 Oakland, Calif. – April 10, 2019: Two tall ships, Lady Washington and Hawaiian Chieftain, are in port at Jack London Square. The sailing vessels give visitors a glimpse of maritime history from the mid-1700's to the late 1800's. The ships are docked at the foot of Broadway through April 23, 2019.